Magpie and Old Lead: It's a Long-Shot (Cultists Get Snipers Too)! 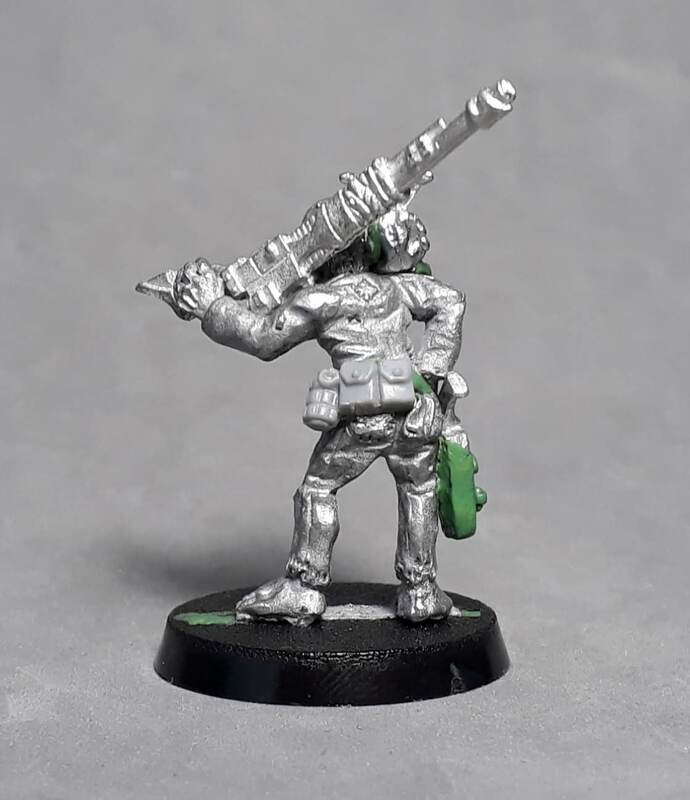 It's a Long-Shot (Cultists Get Snipers Too)! 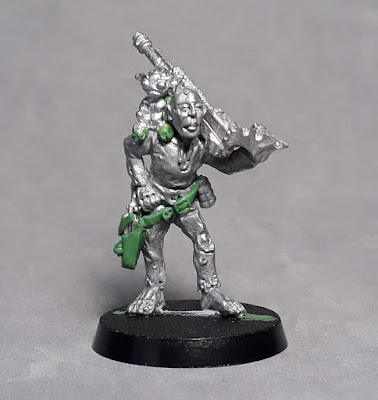 I'm really getting a kick out of my dregs and mutie cult for Necromunda, in spite of the fact that they are ranked 8th out of thirteen gangs in our campaign with a 50-50 win-loss ratio. There's something about pathetic low-lifes that really does appeal to me! Not content with having two snipers already, I decided I wanted a third. This time I've elected to arm Sant, my new cultist, with a long-las instead of a long rifle. It lacks the range and stopping power of a long rifle, but in trade off it's a much more reliable weapon and more accurate at mid-ranges. Once again I've kept the same colour palette as the rest of his crew, this time going for pink on his little shoulder pet. Some of the subtleties are a bit washed out in the photos, but I think it's close enough! Sant has no obvious mutations, but exactly what his pet is or where it came from is a mystery. It could be a chaos imp, random Necromundan beastie, or possibly even a mutated extension of his own mind. You tell me! 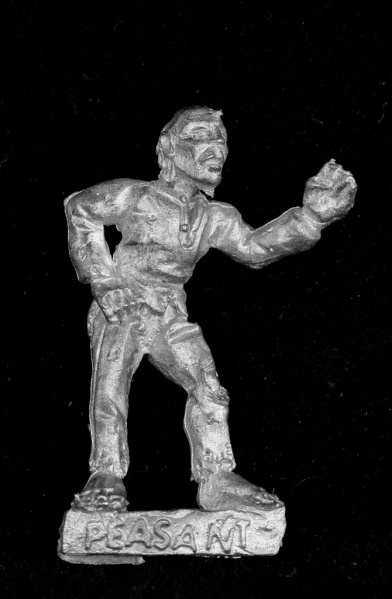 The figure is a conversion of the Peasant from Citadel's Gothic Horror range. The original sculpt is actually pretty oddly posed - perhaps gesticulating mid-conversation. But he's perfect to add a shouldered rifle too! Gothic Horror peasant. Picture taken from the Collecting Citadel Wiki. I added a rifle from the Gorkamorka mutie weapons sprue, and a Necromunda stub gun, as well as sculpting the rather oversized holster and belt. The little creature is a 15mm alien from a range which I forget. I originally gave him teddy-bear feet, but went back and added longer legs and a hand across his belly later. I know the holster is massive and too low. Blame that on the massive Necromunda guns! I think these pouches originally came from a plastic Space Marine kit. I'm never going to say never, but I now have a decent selection of 15 or so cultists to choose from for my gang, so don't think I need any more for the meantime. 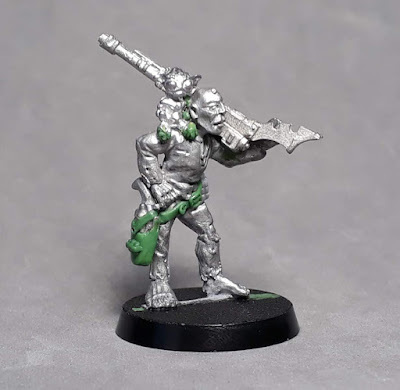 Unless of course I get enough creds to buy an ogryn servitor. Or a plasma gun. Or a flamer...! Sant tries not to look suspicious as he walks nonchalantly past a Guilder convoy. The ambush is about to be sprung! Thanks! Scavvy snipers are a fun concept - I bet they use their buddies as bait. Great use of a rather odd pose! Going barefoot in the hive is how you get mutations anyway, so if he is clear now, he will not be soon. You're right, it's not just verrucas that you need to be worried about! This is brilliant, you've transformed another obscure piece into something unique. Any chance of a big group shot of the gang to date? Cheers Chris! As I said to Ed over on FB, I'm worried that one day I'll run out of obscure ranges to plunder! I do mean to take some group shots, I'll get on it. I'll certainly have a look at the Reddit comp, if only to see what cool stuff people are making. Once again your repurposing looks great. I admire the eye for the correct minis you have. I probably spend too long poring over old catalogues to see what odd figures I can transform. I've barely scratched the surface of pre-slotta though! 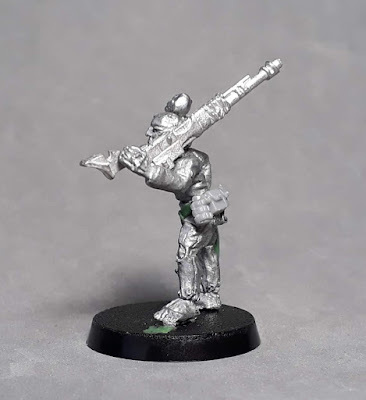 The original pose doesn't immediately jump out as a promising fodder for a great conversion, but you've managed to do it Jon. I live the little pink teddy/beast on his shoulder. I think the holster looks fine actually, reminiscent of the one Han Solo sports. I recommend he's a great conversion and a fun addition to your gang. Sorry for the dumb typos, my phone hates me. I've been looking at the figure on occasion for a number of years without being inspired, so that's testament to your observation. Or possibly it was just waiting for the right project to be used in! Love it! Don't mind me, just a guy with a las rifle. You've got to exude nonchalance. That's how people know you're cool! It's a risk he'll just have to take! That's a really nice figure! Amazing work on the conversion...and the holster doesn't look too big, just standard for 40kish stuff...outstanding stuff! That's a lovely conversion, great work! Thanks Evo! He's one of my favourites from this current project. I missed this - it's absolutely brilliant. I love your metal conversions, they're better than my plastic kitbashing.